You're about to go through a growth spurt! I've finally passed the terrified time of pregnancy, and entered the super excited stage. 16 weeks...we've made it for 4 months. Congrats little one. Size of baby: An avocado. Aaron and I decided that this week would be a good week for guacamole! Movement: I had fun laying very still, then poking my belly and seeing if I felt anything. How I'm Changing: I'm feeling/looking more pregnant. 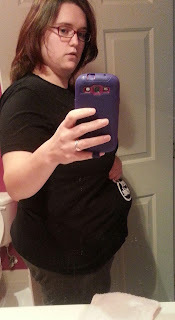 Maternity Clothes: FINALLY. My friend dragged me to a maternity store yesterday, and I bought some jeans (*yey*), and like 4-5 shirts. I like that the shirts are so much longer, because my t-shirts and such are getting too short. How I'm Feeling: not bad. I am more in tuned with my body lately, realizing exactly when I get super tired, or have a headache because I haven't drank enough water. I'm also feeling more at peace with gaining weight, since I'm able to move more, and feel more in control. What I miss: not being so sloooooooww. I walk more slowly, wake more slowly, work more slowly. I just feel so slow. Best Moment this week: Probably buying maternity clothing with my fabulous friend. And...because I finally got around to it, here is a picture...where I think I actually look pregnant. I really should get your father to take pictures, but oh well. At least I cut the toilet out of it! My awesome maternity shirt says 'geek inside' and can be found on Think Geek. Dad claims that my being pregnant makes him want to buy me presents, and since I really like presents, I'm not protesting. He bought me this shirt when I was 5 weeks pregnant though. I waited awhile to wear them. Now I love them both. p.s. 20 days until we find out if you're a boy or a girl. I can't wait, but I really need to think of a fun, creative, way to tell the world. Dad doesn't seem to care much. He is thinking of everything that comes after you're born. I'm living in the moment though:).